During World War II Sweden was officially a neutral country. But because of its proximity to Germany, foreign air-crews crossed its borders frequently and crash landed in Sweden if they couldn't make it back to England. As a condition of neutrality Germany insisted that Sweden hold these airmen in camps. In 1942 we had to arrange an internment camp in the south end of Falun, Sweden at a place called Främby. 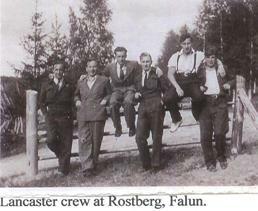 I grew up in Falun, and from 1942 to 1944 I had the opportunity to meet many of the airmen interned at Främby. These are my wonderful memories of two British crews in particular, and the American crews in general. David Perry's story is remarkable. In the early spring of 1942 his Halifax Mk II was shot down somewhere over Norway while they were trying to sink the mighty German war vessel, Tirpitz, which often hid in some of the fjords of Norway between missions. It had been a hard winter: a lot of snow remained on the ground, and the lakes were still frozen. 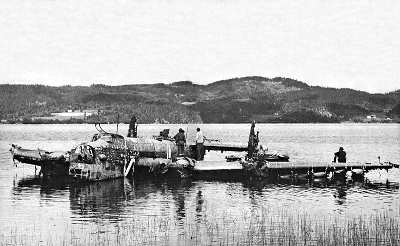 The aircraft crash landed on a lake, but the ice could not hold the weight of the Halifax for long so they had to abandon the aircraft. They had an idea that the Swedish border wouldn't be far off to the east, so they started to make their way towards Sweden through snowy woods. They split up and with almost inhuman efforts made it to the border, except for one crewmember. Once in Sweden they were taken to an internment camp near my home town of Falun, arriving in May of 1942. Their remarkable escape from pursuing Germans was later recapitulated and retraced by David Perry at the request of Queen Elisabeth. The sunken Halifax came to rest on the lake bed some 90 feet down, where she was located by a Norwegian fisherman in the 1960s. As the plane was the only resting aircraft of its kind, it was well worth rescuing and restoring for coming generations. All parts of the aircraft were lifted up and sent to England where the preservation took place. It finally ended up in a RAF Bomber Command Museum at Haden outside of London. The museum was officially opened by The Queen and four or five of the surviving crew members, together with David Perry, as guests of honour. When David made his retracing trip through Norway and Sweden he visited me for the second time. How I learned to know David in the first place. One of the longest streets of Falun is Sturegatan. It stretches through Falun from way up in the north until it ends at Främby in the south. Along this street near the Främby internment camp my father had a little enterprise in the iron construction field. It's worth mentioning that from the beginning, the internment was not at all of the strict kind. The airmen could visit the town to do some sightseeing or shopping. Initially, they marched in with Swedish military guard, but later they could go by themselves. When they came marching along the street outside our workshop, we would greet them and say "Hello," and cheer them up with the few English words that we could. Later, when they were allowed to go into the city by themselves, I and many other youngsters made contact with them to learn better English. Somehow, David Perry and his friend, Jack Cogan, from another crew were gentle enough to be sociable and helped me learn their lingo. I picked a lot up of aircrew slang at that time! It so turned out that both David and Jack wondered if they could help us out in any way at our workshop and perhaps get some extra spending money. They both got permission from the camp, and my opportunity to practise my English was expanded. After a while David got permission to live with my family, and we shared a room for eleven months. David was then smuggled back to England on a ball bearing transport ship on 30 March 1943. I have visited David and his family twice, and we wrote each other until he passed away a couple of years ago. He is really the one behind my English. He helped me learn by arguing. Since we seldom agreed on subjects, I had to learn to respond rapidly, and with a convincing standpoint. While I was in Tunisia for three years in the 60s we lost contact somehow, but he found me again through the Swedish Radio and Television Office in London. One day I got a phone call from Björn Fontander, a Swedish radioman who served there at the time, asking me if I was the Jöran Granberg. I answered that I was. He got my address and then we took up contact again, David and I. Another aircrew worth writing about. Soon after David left in 1943, another crew arrived. 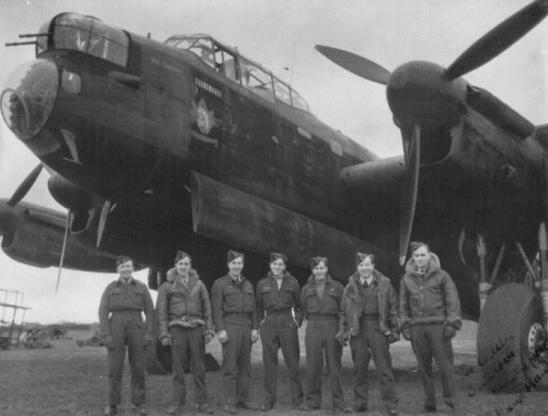 On 21 April 1943 a Lancaster squadron hit the ground at Klagshamn near Malmö. I met all of them, and they visited our summerhouse outside of Falun several times. Three of them were frequent guests at our house and we really kept together. 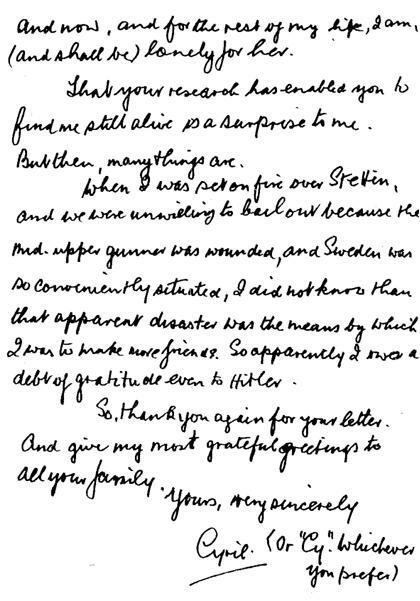 I have several letters from one of them in which he constantly writes about his gratitude for all the hospitality he received from our family. I visited him and his family twice in England and the other Englishman once. The Canadian, Maxwell Coles, I lost completely. Recently, in the Falu-Kuriren newspaper, October 24 , 2005, I was surprised to read about a Canadian, Jeff McDonald, who had visited Falun to investigate his father's activities while he was interned at Främby. He suspected that he might find a brother or a sister left there by his father. Since his father passed away rather young, Jeff had no information on what happened to him during the war. 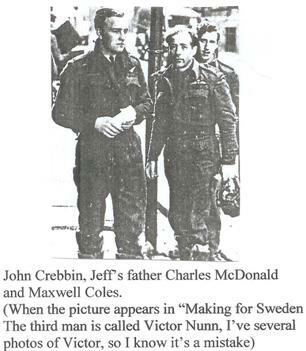 In the newspaper article there was a picture of his father and two of his crew members. I recognised them immediately as Charles McDonald, John Crebbin, and Maxwell Coles. I phoned Falu-Kuriren to get the address for this Canadian, and successfully received his e-mail address. I also saw a television program, which showed some photos of the whole crew "in front of the internment camp at Främby". "Wrong," I said. "That picture I took myself, and it's taken at our summerhouse at Rostberg!" Now, I had all the reasons to get in touch with Jeff McDonald, and that has led to many remarkable contacts. I mailed him photos of each one of his father's crew, photos that were personally dedicated to me with time and signatures. Later I mailed him their addresses at that time in England so he could search for them or their children. One thing led to another, and today both Jeff and I have been able to establish contact with three of the crew still alive and their children. It started when Jeff learned that Maxwell Coles was one of the three in his father's crew that I used to hang around with. He wrote me that Maxwell was still alive and in good condition living not far from him. He indicated that he saw him occasionally and that he would be glad to tell him hello from me. He sent me his address and we have written to each other a couple of times. Max has sent me several photos that were taken at our summerhouse. In one letter he sent me a copy of a handwritten piece of paper on which I had written in Swedish to help him to rent a bicycle and for reference they could turn to Jöran Granberg with my address and phone number. Think of it! He had saved this slip all those years! He's way up around 90 now. 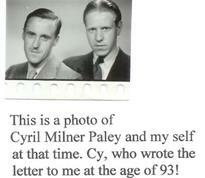 The other one of the three, Cyril Milner Paley, who I went to see twice in Blackpool, took us two years to track down. Somehow Jeff went to England and found both Cy's children and they took him to their father, who is still kicking. This resulted in my getting e-mail from both Cy's daughter and son, along with a lot of photos that were taken at our summerhouse in Rostberg as well as some taken when I visited them when they were kids. So far, Cyril and I have extended a couple of letters and it pleases me to present one to you here. 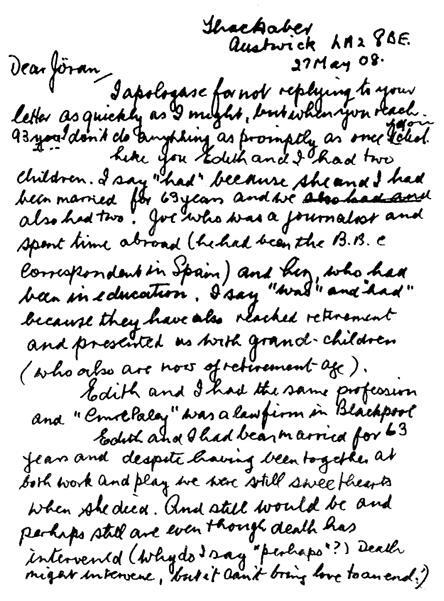 To be able to write a letter with such accuracy and handwritten as well, that makes one really envious. Think of it! He is 93! As the war went on life in Falun was influenced by the increasing number of internees after the Americans had entered the war. From their airbases in England they literally drenched the German cities with bombs. On those missions they lost a number of "flying fortresses," and many more were "injured" and unable to make it back to England. Since Sweden was situated near Germany, it was handy to force land the plane on Swedish ground. And as time went by, the airmen came in by the hundreds on trains from Skåne to Falun. Our camp at Främby became too small, so they had to hire all the boarding houses available in- and outside of Falun. If the RAF crews lived a rather free live in the city, the Americans lived even more free! Living at boarding houses and later, even in the hotels, made them feel like they were on holiday. It's important to note that they received their whole war pay, plus all the additional war risk salary as a pay out every month. This was something! Their monthly salary corresponded to a medium Swede's whole year salary, and believe you me, they started to spend money! And what would you have spent money on in such a privileged situation? On girls, of course! Being "interned" in a neutral country under these conditions! It was like being on holiday for several months with unlimited resources. At that time I was a member of The English Language Club in Falun. One of our members was a drugstore dealer, and he had lived in the United States for many years. He came in contact with the first American aircrew arriving from Skåne in the early stages. Businessman that he was, putting two and two together, he promised to provide them with whatever they wanted, and they didn't have to pay for it until they received their salary. This resulted in about fifty Americans lined up outside his store. He soon realised that with so many new customers in his small locality, he would not be able to handle it without an assistant. Since he knew I spoke English, he rang me up and made me a proposition to start working for him. He was well aware that this new and prosperous business couldn't last for ever, and he didn't want to lose his old Swedish customers, so he took care of them himself, and let me handle the Americans. As a result, I got to know many of them. Since there were so many Americans, and they spent their money so carelessly and generously, they became very popular, especially among the Falun girls. They were taken to the best hotel dance, and their new fiancées bought their girlfriends new dresses and what ever they pointed at. The girl's parents weren't altogether pleased with their daughter's new activity, but even they could be bribed. I know one family who lived in an old, small house with no facility but running cold water. The American installed central heating, WC and a modern bathroom for them. Then it was okay stepping out with their daughter. The merchants of Falun did their best to attract Americans as their customers. One day a watchmaker came in to our drugstore to ask if we could translate his catalogue into English and distribute it to our customers. There is no question about it, the Americans, due to their large numbers, turned the small and sleepy town of Falun up side down. And I know there is one author who, with a few lines, has mentioned about this in one of his books. All of this is an internal history that happened in a short period of time during the war in Sweden -a country that people around the world may have heard of, but hardly even know where it is situated. Because of this history I met some wonderful men and learned English. If I had not taken the advice from a dear second cousin in the U.S. to write it down, these events would probably have remained unknown.